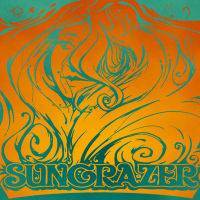 Sungrazer are a new three piece band from Holland. When I put the first track on I thought that they had mis-pressed the new Colour Haze CD. These guys are very inspired by Colour Haze and also go for a total analog sound. The opening track is still pretty cool and has a very laid back stoney feel with some feedback layers mixed into the Colour Haze sound. They are really a stoner riff band as there is only one guitar solo on this entire record. Intermezzo is next and they really surprise you with a super cool saxophone in this short 3 min laid back song with some spacey delay guitar. Somo starts quite spacey and super cool and only in the last 2 minute does the stoner riff kick in to wake you up from your nice trip. Common Believer again sounds very much like Colour Haze but has a nice laid back groove and I really like the bass on this track. The singer and guitarist, Rutger, has a nice delivery. Zero Zero is probably my favourite track on the record, with its heavy groove and more diverse guitar playing and a bit bluesy even. Mountain Dusk starts with a Philip (Colour Haze) bass line, including that plucking sound that is so distinctive of his playing and then the guitar comes in. This track starts very laid back before the Colour Haze riffs kick in and they end the record. The band is not very unique and borrows a bit too much from CH but I quite like the record.